There are plenty of opportunities for you to explore the Magic Leap One platform and mingle with our developer relations team, recruiters, and more. Check out our guide to GDC 2019 for the full list of details. 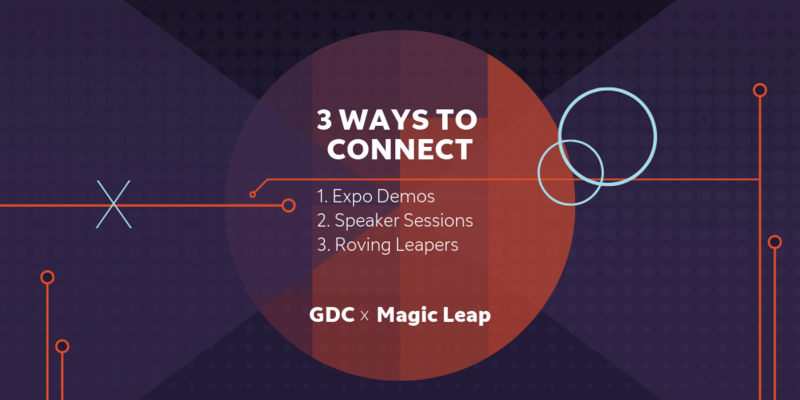 Find Magic Leap at the Game Developers Conference 2019 in San Francisco. From session talks to the expo floor and meeting areas—there are plenty of opportunities for you to explore the Magic Leap One platform and mingle with the fine folks on our developer relations team. In Magic Leap’s Guide to GDC, we’ll share where we’ll be and when … oh, and why you’ll probably care. What’s Happening at GDC 2019? The basics: GDC 2019 is at the Moscone Convention Center in San Francisco. It’s the AAA of game dev events and primarily features the GDC/VRDC Conference and GDC Expo. Virtual Reality Developers Conference (VRDC) happens Monday and Tuesday, March 18—19, 2019. It’s the stuff we spend our days dreaming about: virtual reality (VR), augmented reality (AR) and our personal favorite—mixed reality (MR). GDC Main Conference picks up Wednesday-Friday, March 20—22. It’s all about sessions–expert-led talks featuring stories of the past, present and future of game development. Expo Hall is where you get to experience the magic for yourself. It’s also on Wednesday—Friday, March 20—22, so don’t over-pack your schedule. This is where you’ll see all the next-level projects major brands and indie developers have worked on for the last year. Check out the GDC 2019 floor plan, and keep reading to find out why you’ll need it. Want to connect with Magic Leap at GDC 2019? An all-access pass will take you everywhere we are. Have your pick of nearly 10 Magic Leap–focused sessions on everything from audio UX to character AI in gaming. If formal sessions aren’t your thing, we’re also hosting casual Q&A meetings inside Unity’s booth. Get the details on all of these activations below. We are excited to reveal a new experience with our partners, Epic Games in the Epic Games - Unreal Engine booth. Meet a whole new way to experience spatial computing on March 20—21 at the Epic Games - Unreal Engine booth (S327, S349). And learn more about how our teams use Unreal Engine. You can build Magic Leap One experiences with Unreal too. Details here. We’ll be camped out in the GDC Unity expo booth (S249, S127, S227), answering questions and showing you BRAND NEW DEMOS from the bright minds on our Dr. Grordbort’s Invaders team. Two demos: We are proud to preview a new experience by the Weta Workshop team. And if you haven’t yet experienced Dr. Grordbort’s Invaders, now’s your chance! Stop by, and you may take home a new reality—or at the very least, some digital battle scars. Dr. Grordbort’s Invaders, along with a brand new experience, will be available to play between March 20—21. All-day Q&A sessions: All day Thursday, March 21, you’ll find developer evangelists Tricia Katz and Michael Hazani, alongside others from our Developer Relations team, answering questions about the wild west of spatial computing. Lightning Talk: Stay tuned on social media for more—like the day and time of the Lightning Talk by Thomas Hall, Senior Programmer for Weta Workshop. Want to develop games for Magic Leap One? Get started here. And learn about developing Magic Leap experiences with the Unity editor. Who from Magic Leap is speaking at GDC? Nine of our spatial computing experts will be participating in panels or leading sessions that span the gamut of character development, to audio UX to ethics in AI. Sign up for these sessions on GDC’s website. And if you hate commitment, keep scrolling; we’ve got options for you too. Monday, March 18, 5:30 PM—6:30 PM Room 2002, West Hall Brian Schwab, Director, Interaction Lab GDC: Turing Tantrums: AI Devs Rant!! Magic Leap’s GDC talks extend beyond sessions. Our own Greg Broadmore’s will also be part of Unity’s Keynote on Monday, March 18 at 6 PM PST. Galactic Lessons in Mixed Reality Storytelling, by Michael Koperwas (ILMxLAB Mixed Reality Supervisor)—featuring storytelling tips for Magic Leap One and more. Mental Models and Systems for Spatial Computing, by Timoni West of Unity—a look at human interaction in spatial computing and more. We’re in. (P)Layer Character: Designing Immersive Narratives for Location-Based AR Layers, by Robert Morgan of Playlines—an exploration of digital storytelling and gameplay in the age of immersive, location-based gaming. Faking Mixed Reality: Building Reality Simulators, by John Austin of Funomena—discover how to implement mixed reality simulators for speedier development cycles. Spatial computing offers something for every flavor of game dev. Our publisher program now makes it easy to share your spatial computing experiences with the world. Want to go one step further and take the leap to work with us? We’ll have Magic Leap on-site recruiters at each of the Magic Leap–led sessions. Check out our current job postings here. Learn more about Magic Leap One. TL;DR—Will Magic Leap be at GDC 2019? That’s an emphatic yes. Find us in the Unity and Epic Games - Unreal Engine Expo Booths, plus check out our session speakers. Also, this blog has a couple easter eggs. You might want to read it.